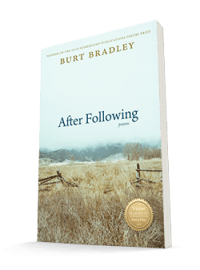 After Following is a collection of poems inspired by what the author Burt Bradley describes as poet whisperers: from Rumi to Kerouac, Ecclesiastes to Philip Levine, Emily Dickinson to Mary Oliver. 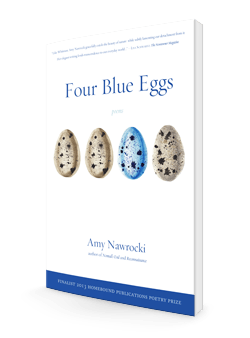 These writers and numerous others’ lives and work serve as guides in shaping the poet’s ways of seeing and reflecting upon wildness in the world. Often this is expressed in poems depicting the severe beauty of Wyoming as well as the wide-open spaces of the inner life. To speak of wildness, following Gary Snyder, is to speak of wholeness, in which hierarchies of value evaporate as well as the separation between the sacred and profane. 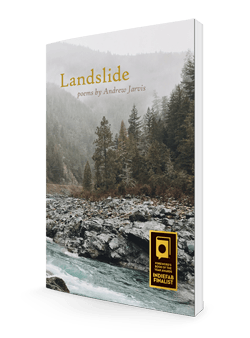 The poems in After Following pay homage to a host of literary mentors, at times directly as in “A Belated Letter to James Wright,” “Postcard to William Stafford.” Other poems are more allusive, like “Rain, A Wyoming Love Song” (after T.S. Eliot) and “A Long Way from Amherst” (following Emily Dickinson). 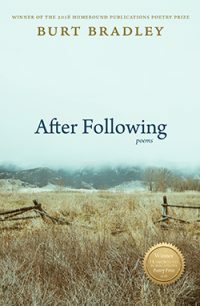 After Following describes the process a poet develops in his or her craft. 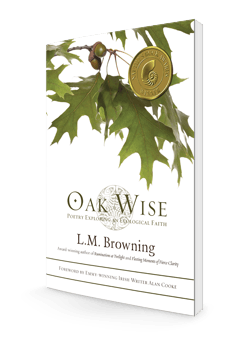 Beginning with reading and learning from the masters, great and small, following in their footsteps, after which one finds his own path, while acknowledging the mentors who served as his guides.